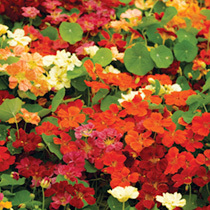 Our favourite nasturtium for border use. The flowers differ from normal nasturtiums in being ‘spurless’ (the long spike behind a normal nasturtium flower). Flowers are also larger and more ‘upward facing’ than normal types with the result that you see more of the colour. Spectacular! Height 23-30cm (9-12”). HA - Hardy annual. Easy to grow plants that will provide a blaze of colour in borders, tubs and baskets. The perfect way to clothe a dry, sunny border. Compact variety. Note: Flowers and leaves are edible and give a peppery flavour to salads.